Struggling to keep on top of your home life? Whether you’re a mum or not, it’s always good to find tricks and shortcuts that save us time and work. Are are nine interior hacks to make life easier. Let’s be honest: the life of a mum is never easy, and your work is never really done. From running around picking up toys and cleaning up food to simply trying to keep an eye on your child at all times of the day, parenting is a challenge – and it can often seem as though your home is working against you. Aside from keeping baby wipes in every room of the house, there are some other helpful hints and hacks that are guaranteed to help get you through the day – and in today’s post, we’ll be working our way from room to room, offering you our top interior tips. As a busy mum, you’ll be all too aware that the other day-to-day chores don’t stop just because you now have children, and cooking can be one of the trickier aspects when you have little ones under your feet. If you’re able to dedicate an area of the kitchen to your children that’s away from boiling water and bubbling pans, then we’d highly recommend this. You can set the kids counting tasks with things like pasta shapes to help them feel involved and you’ll be able to keep an eye on them as you cook. 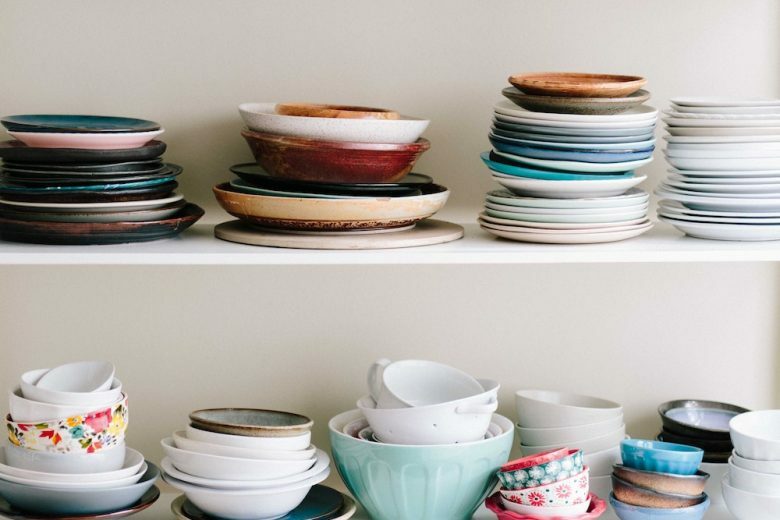 If there’s a way to make tidying up less of a chore, we’re listening! From an easy-to-clean granite kitchen worktop to reusable, wipe-down sheets for the crafts table, these additions to your kitchen space have the power to save you a whole lot of time. Make sure you’re stocked up with cleaning cloths and sprays and you’ll find you can turn your kitchen from kids’ play area into adults dinner space in no time at all. Task the little ones with small jobs like wiping down their eating area to keep them occupied – although be warned that this won’t save you any time, as you’ll definitely have to do it again afterwards! As a mum, organisation is one thing you’ll definitely grow to appreciate – and whether it’s crayons to keep the kids occupied on a rainy day or shape cutters for making cookies, some labelled tupperware boxes will really save the day when it comes to knowing where everything is. These reusable tubs will be a real lifeline in terms of trying to keep your house in order and for the super organised parent, you can even plan out your tubs for the week – labelling boxes by the day for everything from snacks to arts and crafts. This one goes for all rooms in the house, but especially the living area, as this is likely to be where you spend the most time as a family. A quick, easy and cost-effective hack is to cover up your sockets with plasters or some form of sticky tape. With your sockets covered, you needn’t worry about shelling out for DIY store child proof covers, and you can rest assured that your little ones won’t be able to get their fingers into the holes or peel back the tape without you noticing. You might have tidied away the trinkets and valuable ornaments now that your little one is walking, but there are other things to consider if you’re keen to not have to carry your crawling or toddling tot around in your arms every minute of the day. In the 21st-century home, wires are everywhere – as we simply have so many gadgets and devices that need charging on a regular basis. These can be really dangerous around children, so consider investing in electrical outlet and power strip covers to help avoid temptation for little ones. No matter the size of your house, it’s likely you struggle for storage space, so it’s time to get smart. If you’re lucky enough to have space under your kids’ beds, this is a great place to start. Shop around for pull out drawers that allow you to keep toys and shoes tidied away and store them in the hidden under-the-bed space. You can optimise other unused space, too. Pocket hangers or shoe racks for the backs of doors are perfect for storing odds and ends, and you can use the higher up sections to keep certain things out of reach of tiny hands! These treasures have multiple uses, so keep a bag of them to hand at all times. Not only are they great for keeping paint brushes, crayons and just about anything else bundled together, but they have other uses, too. Elastic bands are perfect for busy homes with youngsters, as they can be used to stop doors being locked. Simply hook one over the door handle, twist it in the middle and hook it over the handle on the other side of the door to keep the lock pushed in at all times. As your kids grow and you become more willing to allow them to spend short periods of time alone, there are new issues to consider – can they be trusted not to draw on the expensive wallpaper, for example? A great solution here is to stock up on some blackboard paint so that, not only do you not need to worry about the walls being drawn on, you can actively encourage it. This is a great way to avoid expensive interior updates and remove at least one suspicion from your list when they’ve been quiet upstairs for more than 10 minutes! It might not be sunny all year round, but that doesn’t mean the paddling pool can’t be put to good use throughout the seasons. Whether you’re filling it with snow in December, sand in May or water in August, a paddling pool has a multitude of uses – so make the most of it. It doesn’t have to be confined to the outdoors, either. If it’s too cold or wet to venture outside, bring the paddling pool indoors. As long as it’s clean and dry, you can fill it with balls to create a makeshift ball pool – far cheaper than heading to the local play area. These are just some of our favourite hacks, and we’re sure there are many more you could add – but armed with these 9 pointers, you can make your home a less stressful, more fun space to spend time in as a family. Sophie Armstrong is a content creator for granite and quartz worktop specialists Burlington Granite, who provide a full bespoke worktop solution by offering templating, cutting, polishing and fitting, all driven by 25 years of industry experience.